Find your dreams in this beautiful boxed set of board books from the New York Times bestselling author of The Wonderful Things You Will Be. 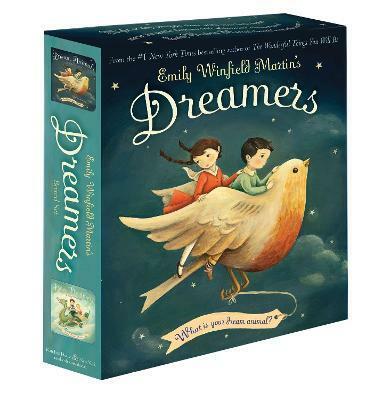 Ideal for bedtime and daytime reading, the books in this irresistible Emily Winfield Martin boxed set--Dream Animals and Day Dreamers--celebrate the imaginations of children who dream. Dream Animals convinces children to close their eyes and discover who their dream animal might be--and what dream it might take them to. Day Dreamers shows readers that letting their imaginations run free will lead them into fantastical day dreams. With whimsical rhymes and gorgeous illustration, this boxed set is perfect for baby shower gifts and for discovering all kinds of dreams! Emily Winfield Martin is a collector and lover of fairy tales, and the original Grimm's tale of Snow White and Rose Red enchanted and haunted her all her life. She is a painter of real and imaginary things, and the author and illustrator of such books as Dream Animals and The Wonderful Things You Will Be. Emily lives among the giant trees of Portland, Oregon, and if you need her, you might look in the heart of the woods. Visit her online at emilywinfieldmartin.com.